Metropolitan Sergius (Tikhomirov) of Japan (1871-1945) was sent to Japan by the Church of Russia as the assistant to and successor to St. Nicholas of Japan as the ruling bishop of the Japanese Orthodox Church. He was born Georgy Alexeevich Tikhomirov (Георгий Алексеевич Тихомиров) on June 3, 1871 (OS) in the village of Guzh near Novgorod, Russia into the family of a rural priest. His father, Alexei, was a popular and famous priest in the area. Georgy did well in elementary school and after graduation entered the St. Petersburg Theological Academy, graduating in 1896. Upon graduation he continued at the Academy teaching theology. During his time at the St. Petersburg Academy he was noted as a prolific preacher and author of many works on Church history in the Novgorod region. Prior to his graduation from the Academy he took monastic vows on September 7, 1895, taking the monastic name Sergius. Then, on December 2, 1895, he was ordained a deacon in the Isakievskii Cathedral in St. Petersburg, and two days later he was ordained a priest. He was subsequently appointed inspector at the Academy. In December 1899, Father Sergius was raised to the dignity of archimandrite and was named Rector of the Academy. On October 8, 1905, Archimandrite Sergius was awarded his Doctor of Theology degree. Then, one month later he was elevated to the episcopacy, being consecrated Bishop of Iamburg and vicar to the archbishop of St. Petersburg. He was 35 years old, an uncommonly young age at the time for entry into the episcopacy. In 1908, Sergius was assigned to be the assistant of Abp. Nicholas of Japan and his eventual successor. He arrived in Japan on June 27, 1908 as the bishop of Kyoto. Already proficient in a number of languages, including Greek, Hebrew, German, Latin, English, German, Arabic, and the Slavic languages, Bishop Sergius immediately began to get acquainted with Japan and its culture and language, and within a year he began preaching Orthodox Christianity among the Japanese people. Since all previous assistants sent to Japan to help Abp. Nicholas returned to Russia, the latter asked Sergius if he intended to remain in Japan permanently or to return in a few years as those earlier had. Sergius affirmed that he had come dedicating himself to remain for the rest of his life. Over the next few years Sergius involved himself deeply in the church and mission and gradually assumed management of the organization, allowing Nicholas to devote his time to the seminary and his extensive translation work. Sergius engrossed himself particularly in missionary efforts, visiting widely, from the southern part of Sakhalin that Japan had gained from Russia after the Russo-Japanese war, to Kuril Islands and Manchuria. Sergius was at Nicholas's side during the last years of his life, and after Nicholas's death in February 1912, Sergius was named in May 1912 the new ruling bishop of the Orthodox Church of Japan as Archbishop of Japan. Well familiar with Nicholas's missionary work, the new archbishop continued Nicholas's steps including publication of theological books through the Tokyo Seminary. Within some six years, however, Sergius had to contend with a different and difficult world. With the Russian Revolution of 1917 and the subsequent takeover by the Bolsheviks, funding for the Japanese mission was cut off. Although this meant that the archbishop had to cut the activities of the mission severely, it nonetheless survived. On September 1, 1923, Tokyo was hit by the Great Kanto Earthquake. The earthquake caused serious damage to the Holy Resurrection Cathedral (Nikolai-do) at the mission's headquarters in Surugadai Kanda in Tokyo. The main bell tower collapsed onto the central dome severely damaging the building and the subsequent fires burned much what was left of the interior. Thus, Sergius had inherited adversity greater than would be expected. Rebuilding Nicolai-do became central for Sergius and in this he did not give up. He toured throughout Japan asking for donations. He asked a young musician, Victor A. Pokrovsky, a refugee of the defeated White Army, to develop and lead the cathedral choir which toured Japan to raise money for the re-construction of the cathedral. Through these extraordinary efforts Nikolai-do was re-built and re-consecrated in just a little over six years. The re-consecration was held on December 15, 1929 with 5,000 guests present including Abp Nestor (Anisimov) of Kamchatka from Harbin. Then, in 1931, Sergius was elevated to Metropolitan of All Japan by the Holy Synod in Moscow. Then, as the Japanese church began its recovery under the leadership of Metr. Sergius, the specter of militaristic nationalism began to rise in Japan. Under this new political climate pressures increased on all that was foreign and Christian. Eventually, in 1940, the pressures became too great. In September of 1940, the government enacted a law that Japanese nationals had to head all religious organizations. Thus, Sergius, his choir director, Victor Pokrovsky, and other non-Japanese were removed from their positions in the church. The metropolitan and his choir director were to spend World War II in obscurity, harassment, under suspicion of being Russian/American spies, and were finally arrested in the Spring of 1945 by the special police. In mid 1945, Sergius ended up under house arrest, his health impaired, and died under unusual circumstances on August 10, 1945, only five days before Japan's part in World War II ended. With Japan in disorder as the war was ending, Metr. Sergius's body was carried for the last rites and burial in a "honey bucket" cart, as he had predicted to friends some years before when he pointed to such a cart that was passing them. 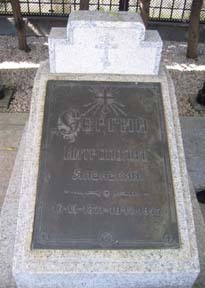 The metropolitan was buried beside St. Nicholas of Japan, his predecessor, in the Yanaka Cemetery in Tokyo. With the intervention of the Japanese militaristic government into the affairs of the Japanese Orthodox Church by forcing all non-Japanese born members out of the Church, the Church administration was thrown into chaos. After the forced "retirement" of Metr. Sergius, the government requested that a Japanese be placed as the ruling bishop. In 1941, under the direction of the military government the Protopriest John Ono was obliged to separate from his wife who became a nun at a monastery in Harbin, Manchuria, then ruled by Japan, and then was consecrated, under the monastic name of Nicholas, as the ruling bishop of Japan. Thus, Bp. Nicholas (Ono) became the first Japanese Orthodox Christian to be consecrated a bishop, though it was under canonically suspect circumstances. Bp. Nicholas subsequently reconciled himself with the Japanese Orthodox Church before he died. Orthodox Church Singing in Japan, by Matushka Maria J. Matsushima and choir leader. This page was last edited on February 7, 2013, at 07:46.